Misconception: Students think you can use the “item (any) of (list)” block in Snap! 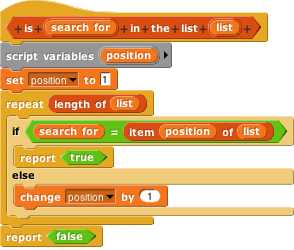 and Scratch to check for every item in a list, but this block actually returns a random item. This will fail most of the time because any is a random item. This block reports whether or not the item exists in the list. If the item if found, it reports TRUE, otherwise it will report FALSE. You can actually make your own version of contains! Here’s one way to create contains in Snap! Emphasize that students should know which HTML tags are self-contained to make writing and debugging code easier. Allow students to resubmit their first few assignments for the course so they can master basic concepts and be rewarded for their persistence. Use Problets as supplementary problems for introductory CS courses to give students more practice.